You and your dog agree: Mosquitos are noisy, painful, and interfere with a fun game of fetch. More important, these tiny, irritating insects can transfer deadly larvae into your dog’s skin with each bite. Home remedies help you avoid undesirable chemicals, but you need to be diligent in applying them to both your dog and his environment to maximize effectiveness. Heartworms are uninvited guests in dogs and other related animals, such as foxes and coyotes. Mosquitos who bite infected animals and ingest their blood can pick up tiny baby worms and then deposit them into your dog with another bite. About six months later, your dog has adult heartworms for the next five to seven years if undetected -- potentially multiplying with each additional infected bite. By the time your dog displays symptoms, such as fatigue, coughing and weight loss, the worms may already be causing permanent heart damage as they choke off the heart’s ability to pump blood normally. By this time he will need veterinarian treatment. An effective mosquito repellant can save your dog’s life -- and save you money and heartache. Several essential oils work to repel mosquitos, notes Dr. Janet Roark, a veterinarian with Hill Country Mobile Veterinary Service in Austin, Texas. She advises purchasing only therapeutic grade oils. Try a combination of lemon and eucalyptus oils. Other oils that serve as repellants include lavender, citronella, geranium, cedar and peppermint. Neem oil also contains compounds that are effective against mosquitos. Mix the oils with witch hazel or spring water, and put in a spray bottle for easy application, or add to a carrier oil, such as coconut or soybean, and rub it on your dog. 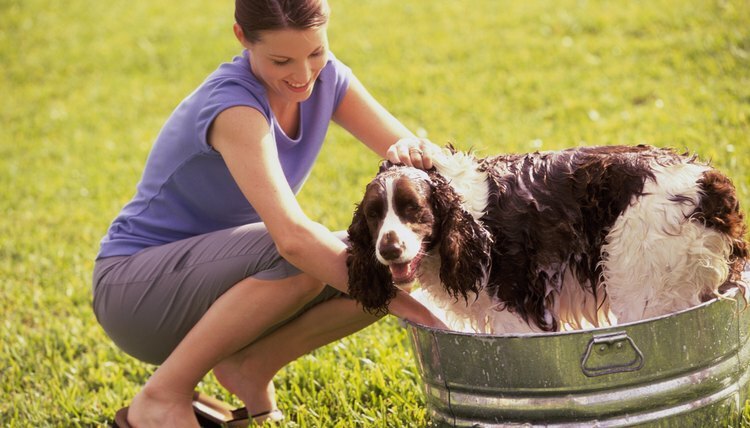 Adding oils to your dog’s shampoo is another effective method. Don’t use tea tree oil without guidance from a veterinarian; it can be toxic to dogs in large amounts, or in small or young dogs. Other oils such as clove and thyme can irritate your dog's skin. There is no evidence that feeding your dog garlic or apple cider vinegar works to repel mosquitos. Even so, apple cider vinegar can soothe the itch from a mosquito bite, and may repel ticks and fleas. Home remedies include making your home unattractive for mosquitoes. Remove standing water so mosquitos can’t reproduce. Look in any receptacle that can hold water: cans, tires, buckets, flowerpots and rain gutters. Change water in baby pools or birdbaths weekly. Add mosquito-loving goldfish, koi or minnows to ornamental pools or livestock drinking tanks. Keep water moving with an aerator or small fountain this avoids the stagnation that draws mosquitos. Keep screens intact and doors closed to keep mosquitos out of your house, and consider placing bird and bat houses in your yard to increase natural mosquito predators. Keep dogs inside earning mornings and evenings when mosquitos are out. If you must be out with your dogs, keep house lights off and light outdoor torches containing citronella or sandalwood oil. Will Alcohol Remove Ticks From Dogs? How Do Asian Tiger Mosquitoes Affect the Native Species? How Long Does It Take for Mosquitoes to Breed on Standing Water? Do Mosquitoes Drink Blood from Reptiles?